EV was nice enough to send us a pair of their new ZXA1 compact powered speaker for the Road Test. I had a chance to play with them in the shop for a while, and used them on a small gig. They are boxed back up and being shipped to the next Road Test participant who is going to have them for a while. But, running the Road test has some perks, and I figured as long as they were here, I might as well open up the boxes and see whats inside! First impressions is that they are very nice looking and pretty small, and lightweight. Each speaker is about 18" tall, 11" wide and about 10 1/4" deep. They only weigh 19 pounds each, and then includes the built in amplifier! I like the full grill on the box. It looks more corporate to me than boxes with exposed horn flares. 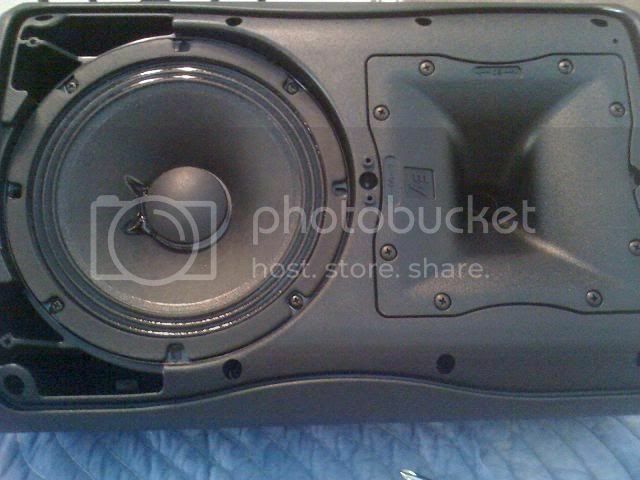 The box holds an 8" woofer, and a 1" driver on a rotatable horn (90 deg X 50 deg), plus a built in amplifier. There is a small built in handle on the top rear to lift and carry the cabinet. Because the cabinet is so light and small, the single handle worked fine for me. The box has a built in stand mount, and I had no trouble putting the box on a tripod stand by simply grabbing the sides of the box. One side of the box is angled so it could be used as a floor wedge. To start, I took off the grill and looked at the components. The horn is rotatable, and is labeled so you know what side is what. With the grill back on, I turned the box over and looked at the amplifier. Nice clean layout. 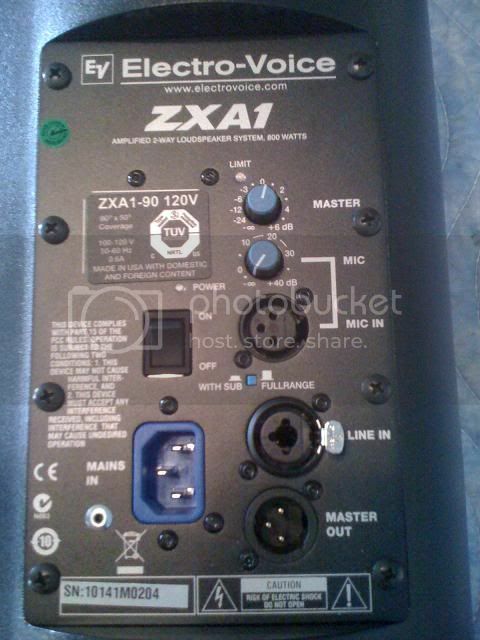 There is a power switch, removable IEC power cord, Master Vol, Limit LED, Microphone input Vol, XLR for Mic input, Combo XLR/1/4" for Line Level input, XLR Master Out to daisy chain, and a recessed switch marked "Fullrange/With Sub". The unit comes with a nice long power cord. For testing, I set up a small mixer, an Ipod, and a few mics. While I was not expecting a ton of bass from the cabinets, with the switch set to Fullrange, the cabinet put out more low end than I would have guessed. It can't compete with a 15" box, but it will give some 10" and even a few low end 12" cabinets a run for the money. It gets pretty loud for a little box. I played a lot of different songs, and used a few different mics (SM57, SM58, and a Blue Encore 100 (Look for the Blue Microphone En Core 100 and 200 Road tests coming soon!) The ZXA1 sounds real nice up close, but then the bass drops off quite a bit at distance. This was not very noticeable with speech and singing through the mics. While the box is ported, it just isn't designed to be a bass heavy box. No big deal in the right applications. I was just going to check out the box and ship it out to the first real Road Tester for it, but liked the boxes so much, I decided to take them to a gig. I had a corporate meeting this morning for about 500 people that ended up being in an L shaped room (after they opened up an airwall for more space) I ended up using 1 ZXA1 on a speaker stand as a delay to cover the L area where they had a breakfast buffet set up. box had tons of power for that application. After the show, I took the boxes home, and was going to pack them up and ship them out when I decided to see what one sounded like with a guitar. I figured an intended application might be a solo or duo act. I plugged my Godin Acousticaster into a small mixer and sent the dry signal to the ZXA1. It sounded very good, and I spent more than an hour playing and having a great time. Here are a few things I noticed though. * No fly points. While I guess the majority of users of a small powered box will never need to fly them, I fly small boxes all the time on corporate gigs, so the lack of fly points is an issue with me. * Monitor angle not steep enough for tall guy (6'3") like me. Standing in a usual gig position with the box on its side on the floor, the horn is not aimed high enough for me. So I used an Acoustical Aiming Device (AKA Block or wood) under the front to angle the box up higher. For a small compact powered box, these are great. I could see using them as backstage monitors, podium monitor, mains on small gigs, delays or larger gigs, and even in convention booths. Can the ZxA1 use the same flying options as the passive version? I don't have the cabinets anymore, but the bottom and pole mount on the ZXA1 looks the same as in the link you posted for the passive box. So I would guess, YES, you could add the plate, or use the spigot in the pole mount to fly them. I would rather have some points built in and just use shoulder eyebolts, and not have to purchase an extra plate, or custom spigot assembly, or additional rigging. Although, I do like the spigot assembly. It looks like it would be pretty quick to hang the cab from a truss or pipe. As I mentioned, I mostly do corporates and meetings. I like having built in points as I have to do a lot of last minute changes in positioning because of video or lighting or client concerns. Its easier for me to simply go to the gang box and grab a couple of eye bolts and shackles. I would guess the majority of the users of this box are not going to fly the boxes, except for some installs. Then, the additional plate or spigot would probably work in most instances for them. Hey Bob, Yes, you can use the same mount to hang a ZXA1 off a baton, etc; like you can with the ZX1. The small size of the speakers made transportation a breeze to smaller gigs, where the speakers were mainly used for vocal support and background music. Craig has already provided a great summary of the physical properties of the box so I will not repeat was has been already mentioned above. However, I would like to add that the slot type handles also seemed to work great for me until your hands got sweaty then you really had to work at not letting the speakers slip right out of your hand. While using these speakers it was quite easy to get a good natural vocal and instrument sound out of the speaker and lack of volume was never an issue while using this box, once with 50 people out front. Granted it was an acoustic gig but still quite impressive for a box this size. I never used the box as a monitor so I cannot comment on the usefulness of the box as a wedge but as Craig pointed out the angle is pretty shallow but I would imagine anyone sitting would not have any issues with placing the speaker as a monitor. 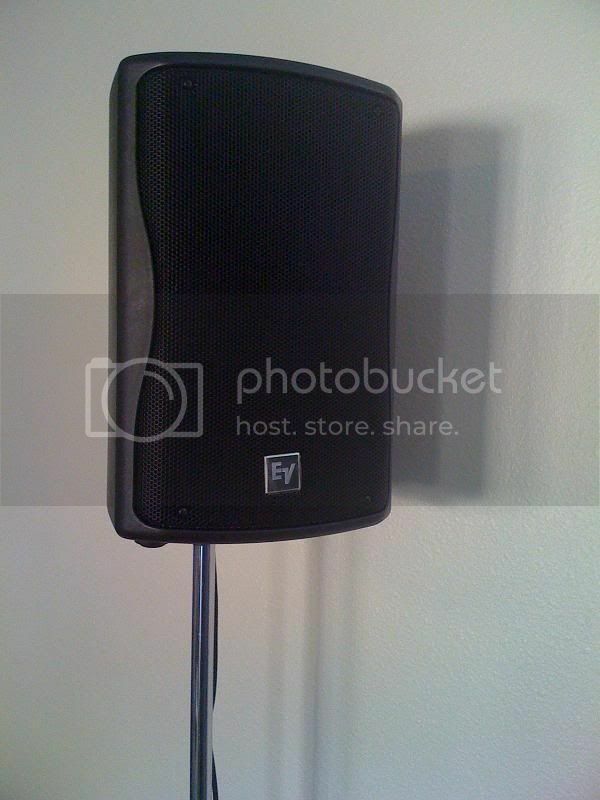 Very small and inconspicuous this was great when using them for some small gigs where space was a premium. Impressive output and sound quality for an entry level powered speaker when used either with subs using the internal crossover switch or running them full range for speech and acoustic guitar. Handle is a unique design, being a slot you put your hand in to carry the speaker. At first I thought it was very practical when I first open the box and took the speaker out for the first time, however once I took the speaker into the field to use and experienced once your hands got sweaty then the speaker would slide right off your hand and was then impossible to carry utilizing the “handle” and had to be transported by other means.